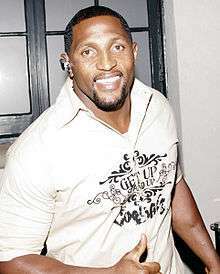 Raymond Anthony Lewis Jr. (born May 15, 1975) is a former American football linebacker who played his entire 17-year career for the Baltimore Ravens of the National Football League (NFL). He played college football for the University of Miami, and earned All-America honors. Drafted by the Ravens in the first round in 1996, Lewis was the last active player from the team's inaugural season. Playing middle linebacker his entire career, Lewis is considered one of the greatest ever to play the position. Lewis was selected to 13 Pro Bowls and named an Associated Press All-Pro 10 times. He is also thought to be the greatest Baltimore Ravens player of all time. He won the NFL Defensive Player of the Year in 2000 and 2003, becoming the sixth player to win the award multiple times. Lewis was also the second linebacker to win the Super Bowl Most Valuable Player Award and the first to win the award on the winning Super Bowl team. Lewis pleaded guilty to obstruction of justice in connection with the stabbing deaths of two men in 2000. After a triceps tear that sidelined him for most of the 2012–13 season, Lewis returned for the Ravens playoff run and a victory in Super Bowl XLVII. On March 13, 2013, it was announced that Lewis would join ESPN as a contributor for their NFL coverage. Lewis was born in Bartow, Florida. He is the older brother of former University of Maryland running back Keon Lattimore. Lewis was an All-American linebacker and wrestling star at Kathleen High School in Lakeland. His father was absent most of his life, which was a cycle through generations, but he was a record-setting high school wrestler before he was incarcerated for drug-related offenses. Lewis's junior campaign was even more successful, as he was again named to the All-American and All-Big East teams, and finished as runner-up for the Butkus Award, given to the top linebacker in college football. Lewis finished his junior season with 160 tackles, the second highest in University of Miami team history after Ed Weisacosky's 164 in 1965. Lewis also totaled eight tackles for loss, two sacks, two interceptions, a forced fumble, four pass deflections and one touchdown. Against West Virginia University, Lewis contributed 15 tackles. Lewis was the top-rated inside linebacker heading into the 1996 NFL Draft, in which Kevin Hardy was considered the draft's only outstanding linebacker prospect. Taken as the fifth linebacker in the draft, Lewis was seen by scouts as possessing speed, tackling ability, and intensity, but many considered his lack of size a potential liability. Lewis earned USA Today's All-Rookie team honors after his 15 tackles for loss led the NFL and 110 tackles led the Ravens in the 1996 season. He added two and a half sacks, six pass deflections, and an interception on the season. Lewis recorded an NFL-best and career high 184 tackles in 1997, second most ever in a season, and earned his first Pro Bowl berth at the end of that season. In addition, Lewis totaled four sacks, an interception, a forced fumble, a fumble recovery, and 11 pass deflections. In 1998, Lewis made his second trip to the Pro Bowl after recording 120 tackles, three sacks, two interceptions, a forced fumble, and seven pass deflections, leading the Ravens in tackles for the third consecutive season. He was also named to The Sporting News All-Pro Team. In what would prove to be Hall of Fame running back Barry Sanders' final game, Lewis and the rest of the Ravens defense held him to just 41 rushing yards. In 2000, Lewis led a defense which many call the greatest in NFL history for a single season. The team set a 16-game single-season record for fewest points allowed (165) and fewest rushing yards allowed (970). The team recorded four shutouts, one shy of the single-season record. The unit finished first league-wide in six key defensive categories. Lewis won Super Bowl XXXV MVP honors, Defensive Player of the Year honors, earned a unanimous All-Pro selection, and was once again named to start in the Pro Bowl. Lewis's regular-season total of 136 tackles once again led the Ravens, and Lewis added 31 tackles, two interceptions, 9 pass deflections, one fumble recovery and a touchdown in the four-game playoff run. In 2001, Lewis earned his fifth consecutive Pro Bowl selection, when he led the NFL in tackles with 162 and earned first-team All-Pro honors. Lewis scored a touchdown in the 2002 Pro Bowl. In the Raven's two playoff games, he totaled 17 tackles, three forced fumbles, and one pass deflection. In 2002, Lewis was limited to only five games due to a shoulder injury. He still managed to rank fifth on the team with 58 tackles. In addition, Lewis compiled two interceptions, two pass deflections, a forced fumble and a fumble recovery. Lewis earned AFC Defensive Player of the Week honors in Week 4 vs. the Denver Broncos after posting 18 tackles (11 solo), two pass deflections and an interception on "Monday Night Football". After having been selected to the Pro Bowl for five consecutive seasons (1997–2001), Lewis's streak was stopped by his season-ending injury. In his absence, the Baltimore Ravens defense would finish ranked 19th in points allowed. Lewis was the leading vote recipient for the 2003 AP All-Pro team, earning 49 of 50 votes. He also won the annual AP NFL Defensive Player of the Year with 43 votes out of 50. Additionally, Lewis earned Pro Football Weekly, PFWA and Football Digest Defensive MVP honors and was named to Dr. Z's Sports Illustrated All-Pro team, Pro Football Weekly's All-NFL team, Pro Football Weekly's All-AFC team, Football Digest's All-Pro first team, and The Sporting News' All-Pro team. Lewis also earned the KC 101 AFC Defensive Player of the Year award for the 3rd time in four years, the 2003 NFL Alumni Linebacker Of The Year, and finished with 161 tackles, one and a half sacks, six interceptions, two forced fumbles, two fumble recoveries, 14 pass deflections, and one touchdown. He was named NFL Defensive Player of the Month for November and AFC Defensive Player of the week for his 15-tackle, one-interception performance against the Pittsburgh Steelers in week 17. In the playoffs, Lewis totaled 17 tackles. In 2004, Lewis was named first-team All-Pro by the AP, second-team "All Pro" by College and Pro Football Weekly and Football Digest, and "All Pro" by The Sporting News. He finished the season with 146 total tackles, one sack, two fumble recoveries, one fumble forced, and six pass deflections. Lewis's 2005 season was cut short by a week-6 injury. He was placed on injury reserve in week 8, having amassed 46 tackles, a sack, an interception, 2 pass deflections, and a fumble recovery in the season's first six games. 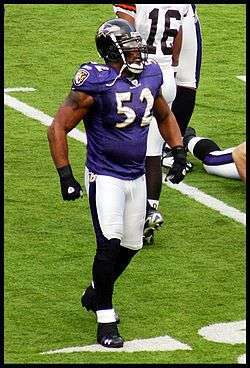 In 2006, Lewis led the Ravens defense to an NFL-best ranking in 14 major defensive categories, including total yards allowed, points per game allowed, and interceptions. The Ravens also finished second in sacks, take-aways, and rushing yards allowed. Lewis missed two games due to an injury, but still recorded 103 tackles, a personal best of five sacks, two interceptions, and eight pass deflections in 14 games. He also forced a fumble and recovered one. The Ravens allowed just one 100-yard rushing performance in the 14 games Lewis played. Lewis was named AFC Defensive Player of the week following his seven-tackle, one-sack, and three-pass-deflection performance against the Tampa Bay Buccaneers in week 1. He was also selected to the Pro Bowl, but withdrew because of a hand injury, ceding his spot to fellow Ravens linebacker Bart Scott. Lewis finished fifth in voting for Defensive Player of the Year. Lewis totaled 15 tackles and a pass deflection in the playoffs. Despite the Baltimore Ravens' mediocre 2007 season, Ray Lewis was the team's leading tackler. Against the Browns, Lewis recorded 16 tackles, recovered a fumble, and returned an interception for a touchdown. He also earned his 9th Pro Bowl nod in his 12-year career. He finished the season with 120 total tackles, two sacks, two forced fumbles, one fumble recovery, 10 passes deflected, two interceptions and one touchdown. In 2008, Lewis led the Ravens to the AFC Championship game while totaling 117 tackles, three and a half sacks, three interceptions, two forced fumbles, two fumble recoveries, and 9 passes deflected. He was named a starter to the Pro Bowl (his 10th) and was named an Associated Press first-team All-Pro for the sixth time. In addition, he was named the AFC Defensive Player of the Week following his eight tackles, two interception, and two pass deflections against the Houston Texans in week 10. In the playoffs, Lewis totaled 29 tackles, two forced fumbles, and one pass deflection in three games. After the season, he became an unrestricted free agent, but agreed to return to the Baltimore Ravens to complete his career. The contract, which runs through 2015 (including two option years), is said to be worth $10 million the first year, but is highly incentivized. In 2009, Lewis was named first-team All-Pro by the Associated Press for the seventh time (9th selection overall) and named to his 11th Pro Bowl. He accumulated an AFC-leading 134 tackles on the season. He also added three sacks, two forced fumbles, one fumble recovery, and seven passes deflected. Lewis added 21 tackles, one sack, and one pass deflection in two playoff games. In the September 2009 issue of Sporting News' Magazine, Lewis was selected to their Team of the Decade (2000s). In week 2 in 2009 against the Chargers, Lewis made the game-saving tackle on Darren Sproles. After the game, Lewis said it was one of the best tackles he has made in his career. In 2010, Lewis was named second-team All-Pro by the Associated Press for the third time (10th All-Pro selection overall) and named to his 12th Pro Bowl. He totaled 139 tackles, two sacks, two interceptions, two forced fumbles, three fumble recoveries, four pass deflections, and one touchdown. Lewis added 13 tackles, one sack, and a forced fumble in two playoff games. On Sunday, November 21, 2010, Lewis became only the second player in NFL history to record at least 30 interceptions and 30 sacks in his career (the other being Rodney Harrison). He is also currently the fastest player (204 games) to achieve that feat. In 2011, Lewis was named to his 13th and what proved to be his final Pro Bowl, and led the Ravens with 95 tackles despite missing four games with an injury. Lewis also collected two sacks, one interception, two forced fumbles, and seven pass deflections. Lewis totaled 20 tackles and one pass deflection in two playoff games. On Sunday, October 16, 2011, Lewis became the first player in NFL history with at least 40 sacks and 30 interceptions in his career. Lewis suffered torn triceps on October 14, 2012 during a game against the Dallas Cowboys, and had them surgically repaired three days later. Sports Illustrated reported that Lewis inquired with an alternative Sports Medicine Lab about treating the injury with Deer Antler Spray, which contains a substance banned by the NFL. Several sources had reported he was expected to return to action December 16 in the game against the Denver Broncos, much earlier than his expected return in January, but he was inactive for the game. On January 2, 2013, Lewis announced he will retire after his team finishes the 2012–13 NFL playoffs. He returned to action for Baltimore's January 6, 2013 game against the Colts and led the defense to a 24–9 win. On the game's last play, Lewis lined up on offense at fullback. The Ravens were not slated to play another home playoff game (since they were the number-four seed), so they wanted Lewis to be on the field for the final play. Next, the Ravens defeated the Denver Broncos in the divisional round, 38–35 in double overtime, and then defeated the Patriots in the AFC Championship Game, 28–13. Lewis's final career NFL game was Super Bowl XLVII, where the Ravens defeated the San Francisco 49ers 34–31. Lewis finished the regular season with 57 tackles, 1 sack, 1 forced fumble, 1 fumble recovery, and 1 pass deflection in 6 games. In the postseason, Lewis led the NFL with 51 tackles. He also contributed 2 tackles for loss and 1 pass deflection in the Super Bowl run. Following a Super Bowl XXXIV party in Atlanta on January 31, 2000, a fight broke out between Lewis and his companions and another group of people, resulting in the stabbing deaths of Jacinth Baker and Richard Lollar. Lewis and two companions, Reginald Oakley and Joseph Sweeting, were questioned by Atlanta police, and 11 days later the three men were indicted on murder and aggravated-assault charges. The fight occurred about 200 yards from the Cobalt Lounge at 265 East Paces Ferry Road in the Buckhead Village neighborhood about two miles north of downtown Atlanta where Lewis had been celebrating. The white suit Lewis was wearing the night of the killings has never been found. Fulton County District Attorney Paul Howard alleged the blood-stained suit was dumped in a garbage bin outside a fast food restaurant. A knife found at the scene did not have any fingerprints or DNA. Lewis subsequently testified that Oakley and Sweeting had bought knives earlier in Super Bowl week from a Sports Authority where Lewis had been signing autographs. Baker's blood was found inside of Lewis's limousine. On April 29, 2004, Lewis reached a settlement with four-year-old India Lollar, born months after the death of her father Richard, pre-empting a scheduled civil proceeding. Lewis also reached an undisclosed settlement with Baker's family. The crisis-management case study of how the Ravens dealt with Ray Lewis during his murder trial was revisited by NFL.com analyst Brian Billick after the 2013 arrest and swift release of the New England Patriots' Aaron Hernandez. Throughout his career, Lewis built a reputation as a leader and intimidating force at middle linebacker. He has led his team in tackles in 12 of his 14 seasons. The Ravens did not allow a single 100-yard rusher in 51 consecutive games from the 1998 through 2001 seasons. In addition to his run defense, Lewis has also gained a reputation as a complete defender. His 31 interceptions rank him 5th all-time among NFL linebackers, and just 6 short of the #1 spot. Since the murder allegations, Lewis's image has recovered, and today he is considered one of the most dominant linebackers in the history of the NFL. Lewis was also selected as the third-best linebacker of all time on the show The Sports List. A poll of NFL coaches selected him as the most dominant player in the NFL before the 2003 season by being mentioned on 10 ballots, while no other player was mentioned more than twice. Team owner Steve Bisciotti stated his intention to erect a statue of Lewis outside M&T Bank stadium. Lewis opened the Ray Lewis Full Moon Bar-B-Que, which operated in Baltimore's Canton neighborhood from February 2005 until 2008. He has also gained several national corporate endorsements, some of which draw upon his tough image. In 2004, Lewis was placed on the cover of the highly popular Madden NFL 2005 video game published by EA Sports, and is also a very avid player of the same series. In 2006, it was announced that Lewis, Hall of Fame running back Gale Sayers, and entrepreneur Mark Bloomquist would form S&L Racing, intending to race both cars and trucks from a North Carolina headquarters. The attempt to join NASCAR racing failed. Lewis had career totals of 2,061 total tackles (1,567 solo), 19 forced fumbles, 117 passes defended, 102.5 stuffs for a loss, 41.5 sacks, 20 fumble recoveries, 31 interceptions for 503 yards, one safety and three touchdowns in 228 games. He has been selected to 13 NFL Pro Bowl games, a record for an inside/middle linebacker, in his 17 seasons, and led the NFL in tackles five times (1997, 1999, 2001, 2003 and 2004). In 2003, Lewis led all linebackers with six interceptions, a total matching the post-merger all-time record for a middle linebacker in a single season. Lewis was named first-team Associated Press All-Pro in 1999, 2000, 2001, 2003, 2004, 2008, 2009 and second-team All-Pro in 1997, 1998, and 2010. His 10 total All-Pro selections is a record for an inside/middle linebacker and ties the record for a linebacker (Lawrence Taylor also has 10 selections). In 21 career playoff games, Lewis has totaled 214 tackles (135 solo), two sacks, six forced fumbles, one fumble recovery, two interceptions for 54 yards, 15 pass deflections, 10.5 stuffs for a loss, and one touchdown. Lewis is a Christian, and his commitment to his faith was featured in a Sports Illustrated cover story in 2006. He has a total of six children, four boys, and two girls with four different women. His son, Ray Lewis III, played college football at Coastal Carolina. Michael Phelps, the most decorated Olympian of all time, found his life purpose and competed in the Olympic Games after seeking Lewis' advice. ↑ "Lewis Bio". baltimoreravens.com. Archived from the original on 2007-09-27. Retrieved 2007-08-16. ↑ "Lewis wins DPOY". espn.com. Retrieved 2007-08-16. 1 2 Associated Press (31 January 2001). "Endorsement exile: Disney, Wheaties among those passing on MVP Lewis". CNNSI.com. ↑ Hensley, Jamison (2 January 2013). "Ray Lewis to retire after season". ESPN.com. 1 2 "Ray Lewis NFL Bio". NFL. Retrieved 2010-10-08. ↑ "Player Bio: Keon Lattimore". CBS Interactive. Retrieved 2011-01-28. 1 2 Price, S.L. (13 November 2006). "The Gospel According To Ray". Sports Illustrated. Retrieved 8 October 2010. ↑ "Miami In the Polls". College Football Data Warehouse. Retrieved 2011-01-28. ↑ Ralph Hickok (2010-01-27). "History – Football All-America Teams 1977–present". Hickok Sports.com. Retrieved 2010-09-28. 1 2 "ESPN Classic – Lewis knows Super Bowl tragedy, triumph". Espn.go.com. Retrieved 2010-09-28. 1 2 3 "FYI Online". Umuc.edu. 2004-06-28. Retrieved 2010-09-28. ↑ Plaschke, Bill (April 19, 1996). "Rating the NFL Draft". Los Angeles Times. Retrieved November 8, 2011. ↑ Mulhern, Tom (April 19, 1996). "Packers in desperate need for more depth at linebacker". The Capital Times. Retrieved November 8, 2011. ↑ "NFL Draft: Top prospects // Defense". The Orange County Register. 20 April 1996. p. D15. ↑ "NFL Box Score for 12/27/1998". databaseFootball.com. 1998-12-27. Retrieved 2010-09-28. ↑ Byrne, Kerry (26 June 2008). "The greatest defenses of the Super Bowl Era". ColdHardFootballFacts.com. ↑ "The List: Best NFL defense of all-time". ESPN Page 2. ↑ WolfpackSteelersFan (10 March 2009). "A Statistical Analysis on the Greatest Defenses in NFL History". SB Nation: Behind the Steel Curtain. ↑ "Green, Tomlinson share AFC award". NFL.com. 2002-10-02. Archived from the original on 2002-10-19. Retrieved 2013-08-20. ↑ "Kitna, Lewis and Vanderjagt earn AFC honor". NFL.com. 2004-03-18. Archived from the original on 2004-03-18. Retrieved 2013-08-20. ↑ "Brady, Lewis, Anderson earn AFC honors". NFL.com. 2004-02-15. Archived from the original on 2004-02-15. Retrieved 2013-08-20. ↑ "Pennington, Lewis, Vinatieri earn AFC honors". NFL.com. 13 September 2006. Archived from the original on 2007-07-13. Retrieved 2013-08-20. ↑ Associated Press (2007-01-30). "Teammate Scott to replace injured Lewis in Pro Bowl". ESPN.com. Retrieved 2013-08-20. ↑ Associated Press (2007-01-06). "Dolphins' Taylor wins Defensive Player of Year". ESPN.com. Retrieved 2013-08-20. ↑ Associated Press (11 March 2009). "Lewis Re-Ups With Ravens". SI.com. ↑ Corbett, Jim (September 20, 2009). "Ray Lewis the 'firestarter' as thumping hit stops Chargers". USA Today. Retrieved 2009-09-27. ↑ "Houston Texans vs. Baltimore Ravens – Recap". ESPN.com. 2011-10-16. Retrieved 2013-01-19. ↑ Brooks, Matt. "Ray Lewis is done for the year with a torn triceps". The Washington Post. Retrieved 15 October 2012. ↑ "The zany story of two self ordained sports science entrepreneurs". Sports Illustrated. 2013-01-29. Retrieved 10 February 2013. ↑ Bell, Jarrett (2013-01-29). "Ray Lewis denies using banned deer antler spray". USA Today. Retrieved 29 January 2013. ↑ "Source: Ray Lewis back Dec. 16". ESPN. Retrieved 1 December 2012. ↑ "Word of Mouth: Owners, don't be shortsighted – NFL Videos". NFL.com. 2012-12-06. Retrieved 2013-01-30. ↑ Schefter, Adam; Paolantonio, Sal (2012-12-15). "Ray Lewis of Baltimore Ravens not activated for Broncos game". ESPN. Retrieved 2013-01-03. ↑ "Ravens' Lewis says he will retire at end of season". TSN.ca. January 2, 2013. Retrieved January 2, 2013. ↑ Hanzus, Dan (2013-01-20). "Ravens roll by Patriots to advance to Super Bowl XLVII". National Football League. Retrieved 2013-01-20. ↑ "Ravens Are Super Bowl Champs! Take Close Win Over The 49ers 34–31". WJZ-TV. February 3, 2013. Retrieved February 3, 2013. ↑ "Buckhead Village to get a Coyote Ugly Saloon – Atlanta Business Chronicle". Bizjournals.com. 2002-07-29. Retrieved 2013-01-30. 1 2 "CNNSI.com – 2000 Bloody Monday – Does NFL star Ray Lewis' arrest for murder taint the game? – Friday March 03, 2000 02:02 PM". Sportsillustrated.cnn.com. 2000-03-03. Retrieved 2013-01-30. ↑ "Lewis murder charges dropped". CNNSI. Retrieved 18 October 2010. ↑ "LawScope.com". Artclu.com. 2000-06-12. Retrieved 2013-01-30. ↑ Schrotenboer, Brent (2013-01-12). "Slayings not forgotten, Ray Lewis not forgiven". USA Today. Retrieved 2013-01-30. ↑ Morgan, Jon; Athans, Marego (2000-06-07). "Cognac, knives and fists". ↑ Yahoo! Sports: Ray Lewis, the shy, quiet kid from Connestee Street, dealing with the pain of ailing grandmother. January 28, 2013. ↑ "Lewis murder charges dropped". CNN. 5 June 2000. Archived from the original on February 13, 2014. ↑ "NFL Fines Ray Lewis $250,000 – ABC News". Abcnews.go.com. Retrieved 2010-09-28. 1 2 "Ravens' Lewis reaches settlement with victim's daughter". Sportsline.com. 2004-05-02. Retrieved 2010-09-28. ↑ Gordon, Chris (2000-06-12). "Two Friends of Baltimore Ravens Ray Lewis Found Not Guilty in the Superbowl (sic) Murder Trial". LawScope.com. ↑ Florio, Mike. "Ray Lewis once again dances around issue of Super Bowl XXXIV murders". Pro Football Talk. NBC Sports. Retrieved 11 February 2013. ↑ Pierce, Scott (5 February 2013). "Pierce: CBS needs to waive Shannon Sharpe after Ray Lewis interview". Salt Lake Tribune. Retrieved 11 February 2013. ↑ Billick, Brian (27 June 2013). "Ravens' handling of Ray Lewis case a lesson in managing crisis". NFL Enterprises. ↑ "Features – NFL pro football articles and coverage from Pro Football Weekly". Pro Football Weekly. 2002. Archived from the original on September 25, 2009. ↑ "No. 18: The ultimate defender — Ray Lewis". USA Today. 2007-06-28. Retrieved 2010-05-22. ↑ Glazer, Jay (2003-06-13). "Most dominant in NFL? Ponder the Raven". CBSSports.com. Retrieved 2013-08-20. ↑ Jones, Luke (2013-02-07). "Ravens have plans for ring, statue in works". WNST.net. Retrieved 2013-05-15. ↑ Gallo, DJ (2008-01-02). "More grace and goodwill from the '72 Dolphins". ESPN Page 2. ESPN. Retrieved 2012-01-22. ↑ "Sayers, Lewis Launch S&L Racing". The Auto Channel. 2006-03-23. Retrieved 2009-12-16. ↑ "NFL star Ray Lewis turned away by NASCAR? Starts Champ Car team". NASCAR News. 2007-04-10. Retrieved 2009-12-16. ↑ "Media Advisory – North Avenue to be Renamed 'Ray Lewis Way'". Baltimore Ravens. 2010-03-10. Retrieved 2011-01-28. ↑ "Player Bios (A – O)" (PDF). Archived from the original (PDF) on March 25, 2009. Retrieved 2010-09-28. ↑ "Player Season Finder Query Results". Pro-Football-Reference.com. Retrieved 2011-01-28. ↑ "Wes Welker's Wife Rips Ray Lewis -- He's a TERRIBLE PERSON". TMZ. January 21, 2013. Retrieved 13 September 2016. ↑ "Ray Lewis' Girlfriend, Mother and Children". Player Wives. 2013-05-01. Retrieved 2014-09-09. ↑ "Ray Lewis' son transfers to Coastal Carolina". Fox News. 2015-01-13. Retrieved 2015-03-28. ↑ Shaffer, Jonas (August 10, 2016). "Ray Lewis tweets strange thing about Michael Phelps' medal count, deletes it". The Baltimore Sun. Retrieved 2016-09-09. ↑ "After Nearly Dying, Michael Phelps Admits The Secret That Saved His Life And Made Him Swim Again". qpolitical.com. 2016-08-05. Retrieved 2016-09-09.